No matter how well you try to help your child cope with hair loss, it is important to remember that this is a very stressful situation for them to deal with. Consulting with hair care experts and getting the best Alopecia in children natural treatment is vital. Even though they may seem to accept their hair loss situation. It is very important to keep open lines of communication, to answer all their questions as honestly as possible, and to keep a positive attitude around them. A positive attitude in a rough time always helps to ease a difficult situation. Now, here are the 5 main causes for hair loss in children and getting the best Alopecia in Children natural treatment or as per the hair fall type is important. Using natural hair oil and conditioners is also a good decision to make. This type of hair loss is caused by a fungal infection of the scalp, eyebrows, and eyelashes skin that attacks the hair shafts and follicles. This infection is commonly referred as “scalp ringworms.” The fungus invades the hair shaft and causes the hair strands to break at the surface. Tinea capitis is associated with round patches of baldness with black stubble from where the hair broke off at the surface. Some children may also have kerion, which is the swelling of the scalp. This type of hair loss is contagious and is transferred through contact or sharing hair utensils. 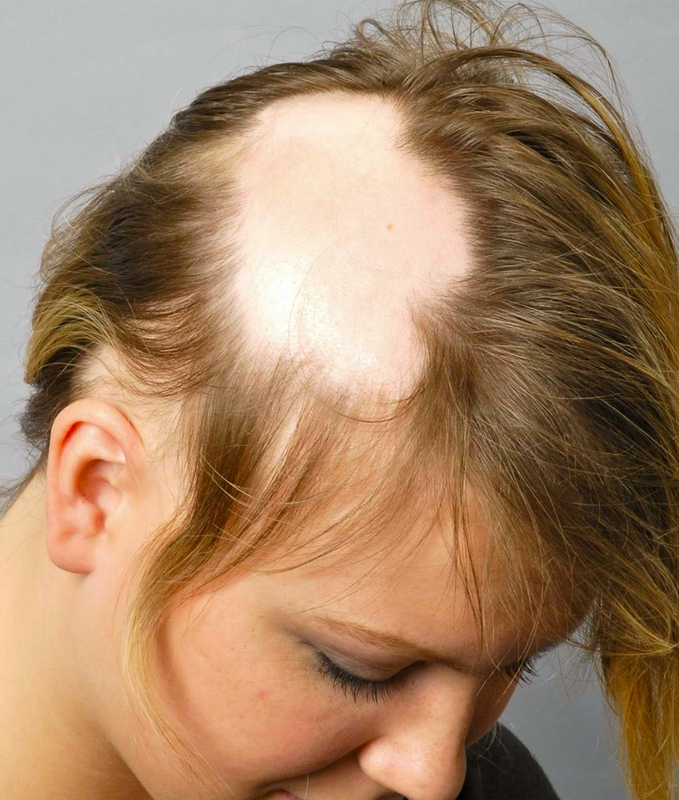 Alopecia Areata is a very common form of patchy hair loss for children. It is generally associated with a sudden appearance of one or more bald patches around the scalp that may be up to 2 inches in diameter wide. The hair around the patch tend to be lose, while the scalp looks normal with no signs of scaling or inflammation. Although the causes are a mystery, this condition is normally accompanied with nervousness and stress, so it is not contagious. Some children with this condition may also develop a grid-like pitting of the nails. Hair re-growth generally can take up to 12 months and is temporarily white. Fortunately, children tend to have a higher resolution rate than adults. In case of hair fall or problem of hair loss, it is better to seek Alopecia in Children natural treatment. Traction alopecia is physical damage to hair, which is generally seen more in girls than boys. The human hair is quite fragile and gets easily damaged by chemical and physical strain from beauty procedures like blow drying, straightening, curling, beaching, pony tails, braiding, etc. Children tend to suffer from Traction alopecia more than adults because their hair strands tend to be thinner and less dense. Adult hair on the other hand, has had plenty of time to have grown in strength and quality to not be effected like children. Trichotillomania is the compulsion to pull out one’s own hair resulting in irregular patches of incomplete hair loss mainly on the scalp. The tendency to pull out one’s own hair is generally a result of nervousness or anxiety. Effluvium is hair loss associated with an illness or emotional stress. Hairs that were in their growth phase can suddenly shift to their resting phase during the illness or emotional stress. As a result, 2-4 months later, the hair will begin to shed since the follicles shift from a stage of growth to dormancy and can last for 6 weeks. This type of hair loss does not show up in patches and is very easy to be reversed. Saini Herbal Oil, conditioner and other products are helpful to provide better support to Alopecia in children natural treatment.